Post subject: Cuda or snook? 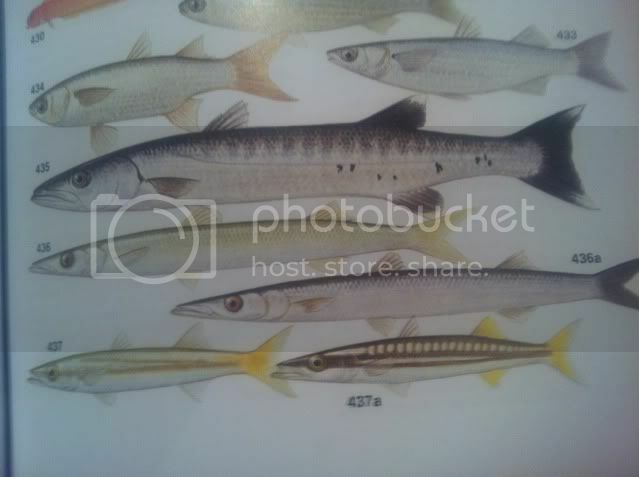 Saw a fish today looked alot like 435 in the pic below which is a barracuda, but didn't have the bands more of a solid colour on the top half like 436a(which is the snook) but didn't have that slim build was more heavy built like the cuda? Post subject: Re: Cuda or snook? Yeh was in PPB (frankston) I was thrown off by the bulkyness of it. Yeh like those top ones, only saw it from the top though, take it those are snook? they can grow quite large as this old photo of southcoastspero shows. !